An American mechanic does not exercise his trade as he has learned it: he is constantly making improvements, studying out new and ingenious processes either to perfect his work or to reduce its price, and is, in most cases, able to account for the various processes of his art in a manner which would do credit to a philosopher. The Bohemian-born, Vienna-educated immigrant Francis J. Grund admitted to a lack of “a certain mechanical perfection” in American-made products, especially compared to those made in England, where “a greater division of labour and long-followed practice in a narrow circumscribed trade” assured a refinement in handiwork. But, as he observed, the American craftsman more than compensated through his versatility and willingness to innovate. With the abundance of wood in the New World, a furniture maker could afford to make a mistake and begin over again. 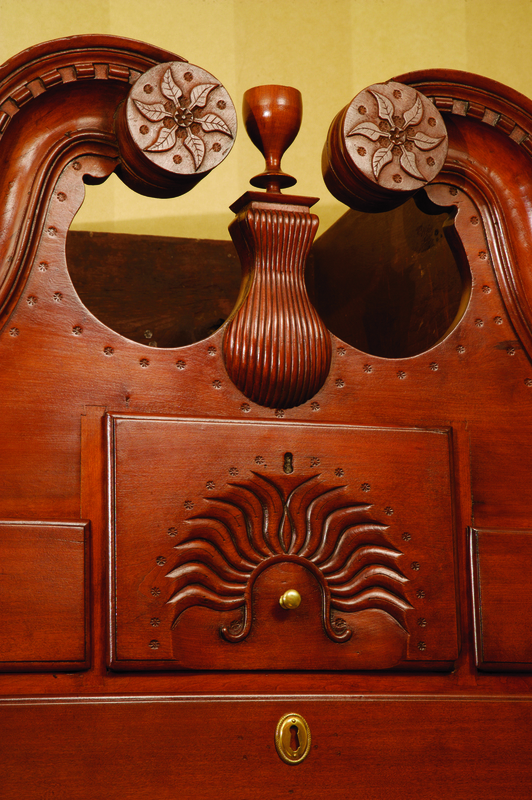 Cabinet- and chairmakers created innumerable variations in the construction, style, and decoration of furniture. Why particular preferences developed in certain places-the stylized shell carving in all its glorious whimsy and frivolity seen here could only be found in Connecticut, for example-is an issue raised in a landmark essay by the late Charles F. Montgomery in 1976. He, as well as John T. Kirk and later Philip D. Zimmerman, looked to the work of Hans Kurath in the related field of linguistic geography for answers. Kurath “argued against the prevailing theory that the local dialects of American English represented substandard modifications of a single form of speech,” believing instead that “dialectal differences among his twentieth-century American subjects owed their origin to related differences in England at the time of American settlement and to the influences of various migratory groups in the intervening years.” The same almost certainly held true for furniture, and can still be seen in American preferences today. Image: Detail of a cherry chest-on-chest, Norwich-Colchester area, Connecticut, c. 1780. Private collection; photograph by Paul Rocheleau.